This year Cooler Master will be present at the biggest IT fair of Europe yet again: CeBIT 2013. Tradition is to announce many new products to the public during this event and the 2013 edition will be no different. With this we would like to give a first impression of some of the new products on offer during this year’s CeBIT. 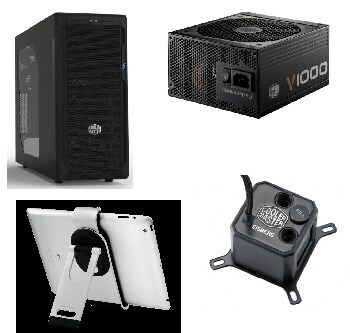 CeBIT will be the birth of several new product series within the Cooler Master assortment. These will be shown in hall 17 at the Cooler Master booth in the business area. Among them is the new N series in cases, which consists of the N200, N300, N400, N500 and N600. This series, which has both M-ATX and ATX cases, is placed between the CM Force and Silencio series and aim at providing good cooling while maintaining an affordable price. On the other hand we will also present a new M-ATX model in our Silencio series which will offer the trademark low noise production. In our power supply line up we will introduce two new series: V-series and B-series. The V-series is an all-new full modular PSU series which is 80Plus Gold certified. With its very stable performance and low noise level these PSUs are perfect for the enthusiast users. Next to this are the B-series which offer at least 85% efficiency, have an attractive black look and are highly affordable. The B-series power supplies will be available in 500, 600 and 700w, while the V-series will be offered with 700, 850 and 1000w. Next to these cases and power supplies we will also showcase several new CPU coolers at CeBIT. The focus will lay on two different technologies; our water coolers on one hand and the vapor chamber technology on the other. Both the V8GTS as the TPC612 will be visible with this new Cooler Master technology and a live setup of our German water cooler Eisberg will show everyone just exactly what it’s made of! Of course we will not neglect our growing product line of mobile accessories. We will offer a wide variety of these products with a special focus on our latest iPad stands: DUO, REN and REV. These products, which combine style with functionality, will certainly make an impact during this event. Some of the new functionalities we use for these products are rarely seen within this sector and are sure to surprise everyone! Last but not least we will also show the latest and upcoming CM Storm gaming gear. Be sure to check out the all new eye catching Aluminum series, consisting of a new keyboard, mouse and headset! Due to our years of experience with aluminum you can be sure that these will be truly astonishing. Also there will be the introduction of new mechanical gaming keyboards in our Quick Fire series so be sure to pay us a visit at Hall 17, C44.